When Markello Spivey walked into his guidance counselor’s office in a Duval County high school, he saw college banners hanging in the room. But before he could dream of attending one of those colleges, his guidance counselor told him that instead of pursuing higher education he would be more fit to pick up a trade. Since sixth grade, Spivey was told he had a learning disability and, after being placed in special education classes, not very many people believed he was college material. But one day, he decided to stop listening to people and listen to his heart, which was telling him that he was capable of learning and that becoming a college grad was possible. However, before his college dreams could come true, he not only had to overcome the stigma associated with being labeled as having learning inabilities but also had to overcome the hurdle of getting into college without an acceptable diploma. The inspiration Spivey needed to jump these hurdles came in the form of a presidential election. College at Jacksonville. After he received his GED, he set out for an associates degree at the college and graduated with honors in 2014. During that time, he met several mentors and FAMU alumni who encouraged him to make FAMU his next stop, due to its nurturing and scholarly environment. Fellows, teaching young people and members of underserved communities about financial literacy. 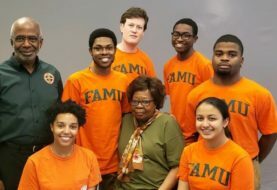 Hear more about Spivey’s story on FAMU Now, which airs on WANM-90.5 FM this Sunday, May 6, and next Wednesday, May 9, on Sirius XM Channel 142.